Examine the types of multi-panel systems available and their most appropriate applications, both aesthetically and from an energy performance standpoint. Describe the range of material and threshold options, and their critical energy performance and sustainability impacts on the building envelope. Identify the key specifying considerations for multi-panel door systems. Discuss essential manufacturing core competencies when considering multi panel systems providers, including necessary energy performance testing, sustainability considerations, and certifications. An architect puts pen to paper, dreaming up an initial sketch that melds a building seamlessly with its environment, complementing topography, and surroundings. The ability to bring the outdoors in, and for a building to reflect its surroundings, is a hallmark of modern design. Outdoor rooms that flow naturally into interior spaces not only enhance a structure’s footprint, they also provide ventilation, fresh air, and daylight, and connect occupants to nature. Facilitating the fusion between the interior and the outside is the job of multi-panel door systems. A multi-panel door system is a door or window system with multiple operable panels that open sequentially to create a large opening. Reaching beyond the capability of a traditional hinged door, multi-panel systems don’t just transition between indoors and out. Instead, the wide and seamless opening they furnish blends nature into a room or series of rooms, eliminating the perceived divide. Not only do multi-panel door systems improve important health metrics, like indoor air quality, as enhancements in manufacturing and technology have augmented door efficiency, these systems can occupy a greater area in the building envelope without compromising overall performance. Multi-panel door systems eliminate barriers between interior and exterior spaces, creating a natural and open flow. 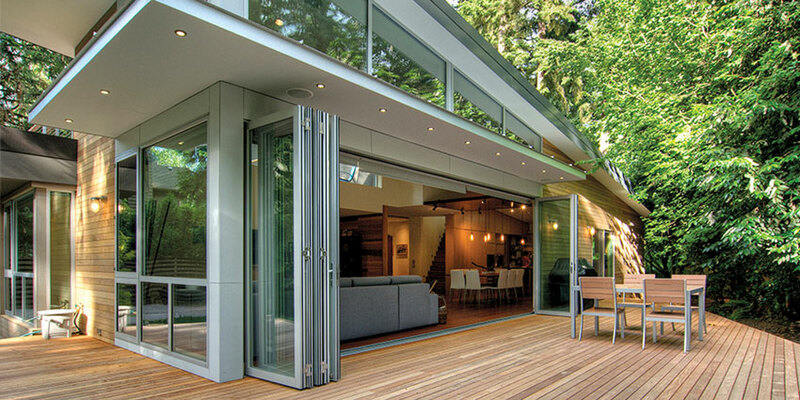 Aluminum thermally broken folding doors showcase the beauty of surrounding landscaping at this home.